How can you tell a story with iconography? How can you tell a story with iconography in art? I will explore this by discussing my 2014 painting “We Can Talk”. I had a visual pallet and a general idea of what I wanted to explore. However, I ruminated over the actual iconography for months before finally getting to the point where I was going to execute the final image. I wanted to explore the idea of what makes a dynamic in a relationship work. I also wanted to explore how miscommunication can lead to dysfunction and eventually the dissolution of a relationship between two people. This painting wasn’t inspired by a specific event in my life, per se. I guess you could draw parallels to my life if you really wanted to get into some deep psychological analysis, but for all intents and purposes this is not about me. I felt no immediate compulsion to deal with any specific relationship in my own life at the time anyway. More than anything this piece was the result of my interest in exploring telling a story from an editorial perspective. In college I had a really fun and interesting class in editorial illustration under professor Kurt Vargo. In this class we explored how to create art that told a story about an event, or translated a written article. 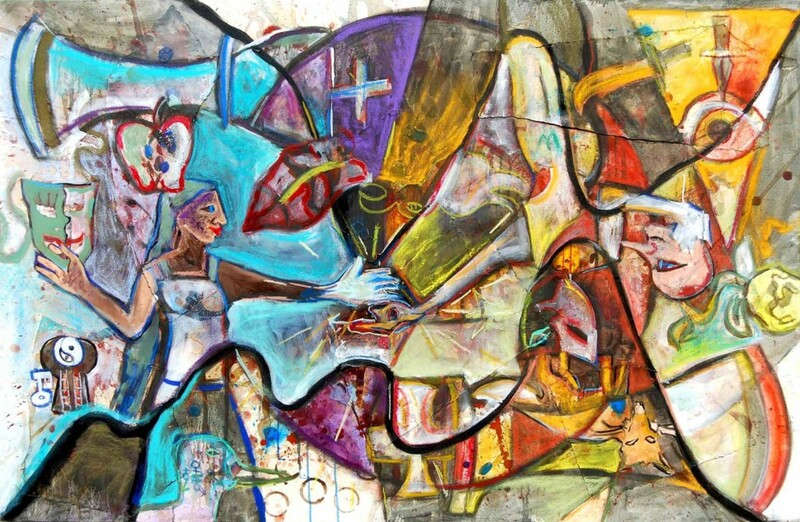 The general idea was to create a story that contained commentary that provoked thoughtful discussion within the viewer. I had done a lot of research into different icons and images leading up to the completion of this painting. I knew I wanted some elements to read a little more overtly than normal. However, I wanted things to be just cryptic enough to lead the viewer down a journey. I wanted them to take some time to really dig into the painting and decipher it’s meaning. I drew a lot of influence for this painting from artist John Dyer Baizley. I actually took a class with this artist at SCAD so I knew how his process worked and how he formed ideas with personal imagery. I’ve gotten a lot of different reactions to this painting. If the goal is to elicit a response, and in this case it definitely was, I succeeded. Some people loved the painting, some people were repelled by it. The biggest surprise to me was how much people assumed it was about “me.” I can assure you that creating art is just as much about capturing what you see in the world around you just as much as it is about what’s going on inside your mind. I’ve always tried to find that happy medium with my artwork. The two most obvious images are a king and queen chess piece on either side. This is meant to symbolize a game being played by the two individuals. I knew that I wanted two figures to balance each other from opposite sides of the same coin. One figure is male while another is female. I wanted to get into the idea that two people approach truth and emotional honesty from very different perspectives. One figure (the male) hides his true form behind the mask of an actor while holding his head in his hand. He extends his hand pointed in expectation of reward, without any sense of self awareness. the all seeing eye and fox represent possessiveness and lying. The yellow rose at the end of the image represents the end of a relationship. The male has a cockoo bird extended out from under his mid section. A cuckoo bird generally lays it’s eggs in another birds nest. The cuckoo has it’s mouth right next to an anthurium plant, which represents hospitality. This could be seen as a way to exemplify how some people may take advantage of people’s emotional vulnerability. This is meant to represent selfishness. While his motives may be less than honorable, he is honest in his overall intent. The female has her true self, even if imperfect, exposed. She is holding the actors mask in one hand far away, while extending an open, if somewhat “invisible” outward. She has a duck at her base (a Celtic symbol for honesty). She has an apple near her head. Some people interpret this as a religious symbol. However, I wanted to actively avoid overt religious iconography since I wanted to make a painting about the dynamics between two people. Also, there’s literally tons of Christian art from centuries past, I didn’t feel a need to make that the central theme. I may do this in the future, but it will be more of a study of spirituality and religious beliefs, and not a tangent. Nothing against religion, it is a way people do choose to connect, but I did not want this painting to be a vehicle to promote it as a be all end all solution. I think there’s much more to keeping two people together than one aspect of their relationship. I wanted the apple to represent the idea that you have to have a deep knowledge of someone else in order to truly create an emotional bond with them over an extended period of time. Lastly, I have a small keyhole with a yin/yang symbol and two ladders. The thought process behind this pertains to the idea that two people must find balance with one another together in order to truly crate a lasting relationship. There has to be a common goal in mind. The biggest challenge I faced with telling this kind of a story was remaining impartial in judging the actions of the two figures. Though if I am being honest I think doing that with any editorial approach is going to be impossible. You are always inevitably going to take a stance in one way or another. By the time this painting was nearing it’s final stages, all of the icons began to “click.” In a moment of odd serendipity, these elements began to coalesce into one cohesive whole narrative. I chose the title “we can talk” mostly to give the painting an ultimately positive context, despite the dark and seemingly brooding-ish subject matter. I wanted to say with this painting, that despite any actions or situations, communication can always create the opportunity to bind two people together. There’s always a chance to maintain that spark. Thanks for reading everyone! Enjoy.